Roszak’s primary psychological source is Freud; while Maslow and Jung get some brief mentions here and there, he keeps returning to the id, ego and superego, and the heavily gendered relationships with father and mother figures. As a fair amount of Freud’s original theories have either been dismissed or at least heavily annotated, this may make parts of the book seem almost stifling, especially twenty-five years later when we have comparatively more material to work with. But at the time Roszak was bringing up something new, and in a multi-discplinary manner. I admit that at times I found it difficult to see where he was connecting one chapter to another; the book overall feels less like a weaving together of concepts and more a series of chapters, each with its own take on the general topic at hand. Still, there are themes that run throughout: Western society’s rampant consumerism and domineering attitudes, the messages of the oppressed which may hold the keys to ecological salvation, the balance between trying to communicate the dire straits our planet is in while not turning people away with overly condemnatory tones. And I think it’s these themes that are the takeaway. I will admit that this is not my favorite book on ecopsychology, and I could easily read the first couple of chapters and the last plus epilogue and be okay with it. But I think it’s worth reading through entirely at least once just to get an idea of the cultural crucible out of which ecopsychology sprang. Roszak was always a keen critic of our society, and while his words aren’t always pleasant to face, they’re necessary. 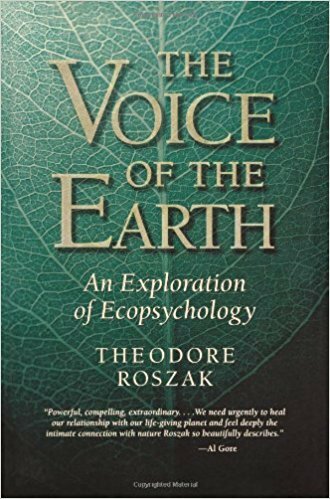 I recommend following this up with his 1995 anthology Ecopsychology, which I will review at a later point, and which is the first to bring together multiple voices talking about both problems and solutions of nature-based psychology and ecotherapy.